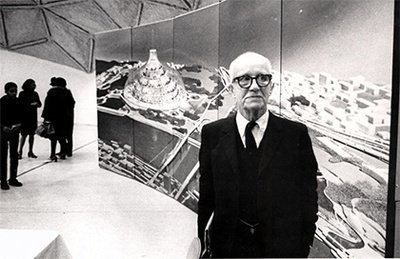 Richard Buckminster Fuller Jr (1895 - 1983) Bucky to his friends, whose birth anniversary we mark on 12 July was born into one of New England's elite but freethinking families. His great-great grandfather, the Reverend Timothy Fuller was a delegate from Massachusettes to the Convention which drew up the US Constitution. He was so outraged at the Convention's acceptance of slavery that he opposed ratification. His grand aunt, Margaret Fuller, was the editor of the transcendentalist journal The Dial, a close colleague of R.W. Emerson and Thoreau. As all the male members of his family, he began university at Harvard but was expelled twice, being more interested in women than in diplomas. He never received a university degree but was self-taught in design, mathematics and architecture. He brought all his ideas together in what he called "The Law of Progressive Order." Today, he is best known for his geodesic domes which have been widely used by relief agencies as shelters for the uprooted and homeless as well as by the US Navy during the Second World War as easily constructed and inexpensive shelters or store areas. Yet it took some experiences for Fuller to find his role in life. He tells of the experience in 1927 with no job and a wife and baby to support, he became depressed. He was living in Chicago, and one day walking along Lake Michigan, he was thinking of taking his life. Then time seemed to stand still and a voice spoke to him "You do not have the right to eliminate yourself. You do not belong to you. You belong to the Universe". From then on, his life purpose was to see "what, if anything, an individual could do on behalf of all humanity." He was influenced by his reading of Mahatma Gandhi but not by Gandhi's fear of science. Fuller thought of the world in terms of flows of information and energy that interact and exchange in a complex totality. Fuller thought of his work as a reply to Mies van der Rohe's "less is more" of luxurious simplicity by the idea "more with less" stressing the need to conserve natural resources by developing sustainable design solutions. Fuller's vision of the designer was as an agent of change, striving to solve the world's problems by translating scientific and technological advances into useful innovations. Fuller asked "How can we get more energy, use less materials and use less time to provide for our basic needs? What do we need?" Fuller always kept his original aim of wanting to do something of benefit for the whole of humanity. He called himself a world citizen. In 1951, along with the poet and editor of the Dark Sun Press, Carresse Crosby (1891 -1970) he tried to set up a Citizen of the World Center in Delphi, Greece where Carresse Crosby had bought land. However, the US government put pressure on the Greek government to ban their residence. Citizen of the World sounded too much like Communist Internationalism in the Washington of the early 1950s. A year later in 1952, a World Man Center was created in Cyprus. Fuller built a geodesic dome, but again US government fears prevented any development of the World Man Center. Fortunately, today the spirit of the 1950s has evolved in Washington. World wide there is a increased interest in Buckminster Fuller's designs, but as he always stressed the physical designs and the non-material thoughts are closely related - not to be separated.